View More In Coffee Cups & Mugs. 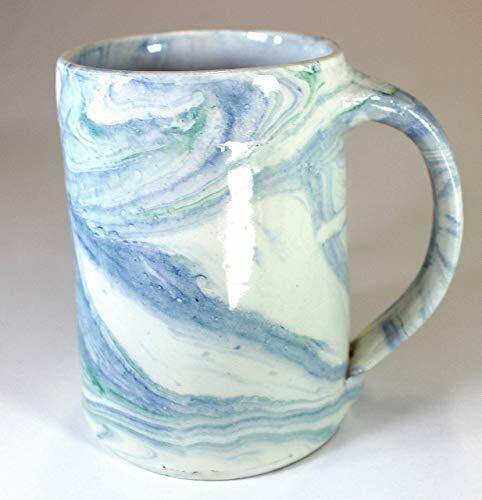 Entirely handmade, hand-thrown earthenware tankard with unique marbled abstract decoration. No two mugs are exactly alike. The marbling is made by swirling ceramic pigment onto the surface of a thick gel. Then this liquid image is transferred onto the mug. Next, the piece is glazes and fired. Lead-free. Handwashing recommended. Not microwave safe. If you have any questions about this product by Marbled Pottery, contact us by completing and submitting the form below. If you are looking for a specif part number, please include it with your message.